For a few weeks now we’ve had 3 pumpkins sitting outside our house. And for a few weeks I’ve been promising my boys we’d make soup out of my daughter’s pumpkin (because she’s too young to decorate hers). 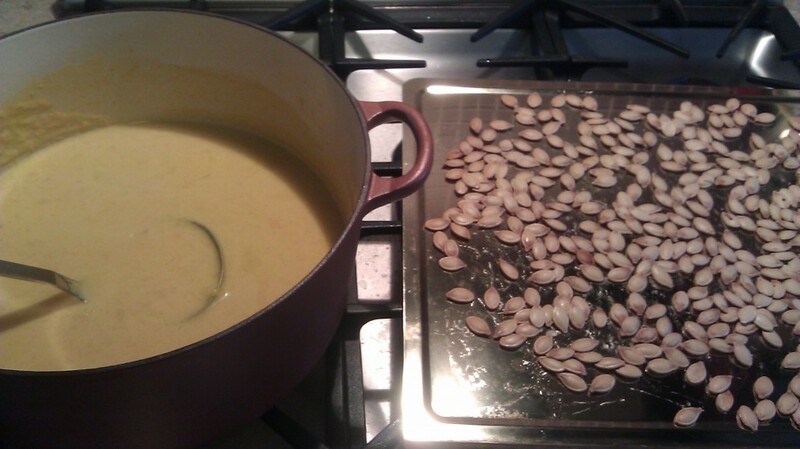 So, this past week my CSA pick-up included a butternut squash…..perfect opportunity to make pumpkin soup. We had a completely free Sunday so I told the boys we’d make the soup as soon as the baby took a nap. My 4 year-old was very excited so he sat in his stool at our island while I chopped onions and prepped ingredients for the soup. My 3 year-old was less interested and just wanted to draw on the pumpkin. So, I pulled out some washable markers so he could be entertained while I tried to get all this cooking done before nap time was over. When I was ready to cut the pumpkin open both boys were pretty thrilled. I had never cut a pumpkin open for them before so this was all new to them. Oh, and they wanted toasted pumpkin seeds because we read about them in one of their Halloween books practically every night, so I pulled the seeds out and put them into a colander for later. My 3 year-old was a little distraught seeing his beautiful artwork being destroyed and discarded into the trash….but they were both very helpful with scooping the seeds out of the butternut squash. 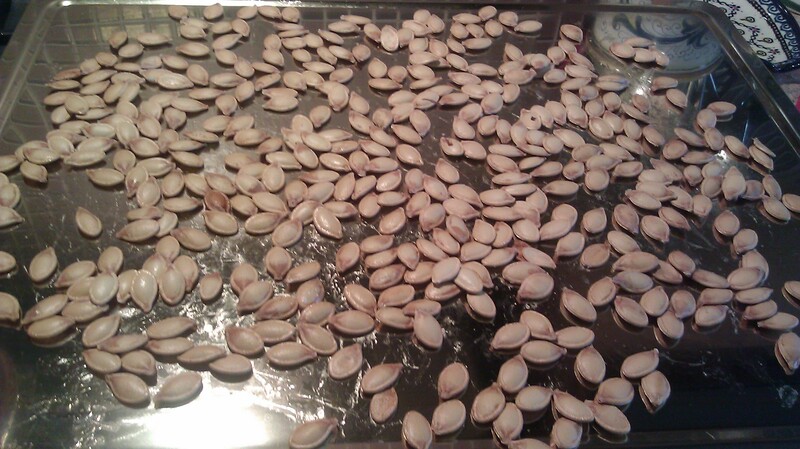 While the soup simmered I washed the seeds and prepared them for toasting. At this point the boys had long since disappeared into the den and were playing on their own, so I was able to puree the soup and and finish it while they were busy. I called them in to see the seeds toasting in the oven and gave them each a taste of the soup. 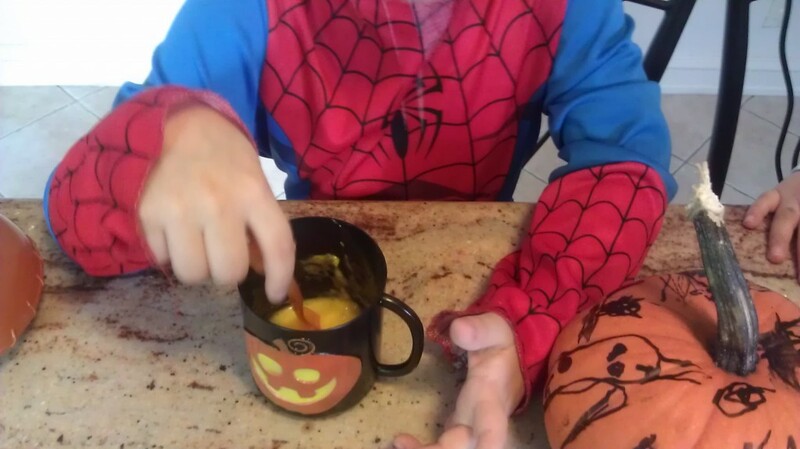 My older son wanted to try it in a Halloween cup, but my little one had absolutely no interest. Once the seeds were toasted I threw a few into the soup as a garnish and the rest were enjoyed as a snack in front of the TV as we watched Halloween shows. Winter Squash Soup – I slightly altered Ina Garten’s recipe from Food Network’s website. Heat the butter and oil in a heavy – bottomed stockpot, add the onions, and cook over medium – low heat for 10 minutes, or until translucent. Add the pumpkin, butternut squash, chicken stock, salt, and pepper. Cover and simmer over medium – low heat for about 20 minutes, until the pumpkin and butternut squash is very tender. Process the mixture through the medium blade of a food mill or hand held mixer. Return to the pot, add the half – and – half, and heat slowly. If the soup needs more flavor, add another teaspoon of salt. Serve hot with garnishes, if desired. Preheat oven 350. In a bowl mix seeds, olive oil, and salt. Spread on baking sheet and bake for 30-45 minutes or until seeds are lightly toasted. Eat whole once cooled or use as garnish for soup. I love pumpkin, but I’ve never had pumpkin soup. My husband just did a pumpkin soup from scratch last week. It was low calorie, creamy and delicious! I’d love to try your squash soup next. Oh yum. I’m so excited it’s finally soup weather here! I’ve always wanted to toast pumpkin seeds, but never was quite sure how to do it. Going to try doing some of them this weekend. Seems like it would be a very healthy snack. I have never had pumpkin soup….I may have to try it this year. I’m not a pumpkin fan, but this sounds like something my husband would love! Cinnamon and nutmeg…yum! Very warming for the fall and winter. I love pumpkin and have yet to find a pumpkin recipe that I don’t adore! Thanks for the new recipe! hmmmm not quite sure how i will like this but can only find out by trying it…going to give it a try! Huh! Never thought of pumpkin soup before but the kids and I will be trying it! this pumpkin soup looks delish… will def have to give it a try!